So far in my series on red meat, I’ve discussed why red meat is good for you and why grass fed is a better choice than grain fed. We now know that red meat is a healthy choice, due to its high nutritive value and superior fatty acid profile among other reasons. In the comments on these posts, however, I’ve noticed a few readers have mentioned other components in red meat that are concerning, due to evidence for the potential for inflammation or carcinogenesis. Yet is this evidence strong enough to advise a reduction in red meat, or is this yet another false alarm creating unnecessary fear of eating meat? Red meat and inflammation: another myth bites the dust. Two different controlled trials have measured inflammation markers in response to increased red meat intake, and both have found that red meat does not elevate these markers. The first study concludes that increasing red meat consumption by replacing carbohydrates in the diet of non-anemic individuals actually reduces markers of inflammation. (1) The other study showed that in anemic women, inflammation markers on a diet high in red meat were not significantly different from those on a diet high in oily fish. (2) This evidence suggests that red meat is not more inflammatory than other meats for most people, and is potentially less inflammatory than dietary carbohydrates. However, I’d like to discuss a couple of other specific mechanisms that are often blamed for inflammation. Despite the lack of controlled trials demonstrating that red meat is inflammatory, there has been recent concern over a compound in red meat called Neu5Gc. (3) Neu5Gc is a monosaccharide that acts as a type of signaling molecule in mammalian cells, and one of its functions is to help the immune system distinguish between ‘self’ cells and ‘foreign’ cells. (4) Humans lost the ability to produce Neu5Gc millions of years ago through a genetic mutation, although we still produce the closely related compound Neu5Ac. (5) Humans are unique in this respect, because most other mammals still produce Neu5Gc, which is why that compound is found in mammalian meat. When humans consume red meat and milk products, we incorporate some of this compound into our own tissues, especially tissues that grow at a fast pace such as fetuses, epithelial and endothelial tissue, and tumors. (6) The concern is that most of us also have anti-Neu5Gc antibodies circulating in our blood, and some researchers have suggested that these antibodies react with the Neu5Gc in our tissues to create chronic inflammation, leading to chronic diseases such as cancer. The problem is that researchers are nowhere near proving that hypothesis. Research is in the very earliest stages, and while some fascinating hypotheses involving this molecule are being generated, the studies needed to confirm or refute these hypotheses are nonexistent. Most of the studies done on the topic acknowledge that at this point, any role in chronic inflammation is speculative, but many who have cited their research neglect to acknowledge that limitation. Thus begins a new round of fear mongering at the expense of red meat. In the absence of conclusive evidence one way or another, it can be helpful to remember that red meat has been part of the human diet for much of our history, and remains an important dietary element of many healthy cultures. For example, the traditional diet of the Masai was composed almost entirely of red meat, blood, and milk – all high in Neu5Gc – yet they were free from modern inflammatory diseases. (7) If Neu5Gc really caused significant inflammation, the Masai should’ve been the first to know, because they probably couldn’t have designed a diet higher in Neu5Gc if they tried. Arachidonic acid (AA) is often cited as a source of inflammation, and because AA is found primarily in eggs and meat, this concern could contribute to the view that red meat is inflammatory. AA is an essential omega-6 fatty acid that is a vital component of cell membranes and plays an important role in the inflammatory response. (8) It’s especially necessary during periods of bodily growth or repair, and is thus a natural and important component of breast milk. (9) AA is sometimes portrayed as something to be avoided entirely simply because it is ‘inflammatory,’ but as usual, that view drastically oversimplifies what actually happens in the body. The final concern I want to address involves compounds that are produced when meat is cooked, including advanced glycation end products (AGEs), heterocyclic amines (HAs), and polycyclic aromatic hydrocarbons (PAHs). Again, this applies to all meat, not just red meat, but it can still contribute to the perception that red meat is unhealthy. HAs and PAHs have both been shown to cause cancer in animal models, and although these results can’t necessarily be extrapolated to humans, it’s probably wise to limit exposure to these two compounds. (19)(20) HAs and PAHs are formed when meat is cooked using high-heat or dry cooking methods such as frying, grilling, or smoking. But while cooked meat is the only significant source of HAs, PAHs are a ubiquitous environmental contaminant, and the bulk of dietary PAHs actually come from vegetables and grains. (21) In fact, levels of PAH in leafy vegetables are comparable to levels in smoked meat! However, the highest food levels of PAH are found in charred meats that have been cooked over an open flame. AGEs are different from the other compounds in that they can be formed both endogenously and exogenously. (22) Like HAs and PAHs, AGEs are formed when foods – particularly meat – are cooked, although they are also naturally present even in uncooked meat. However, dietary AGEs do not tell the whole story, because they can also form through various metabolic pathways in the body. One study showed that while omnivores generally have higher dietary intakes of AGEs than vegetarians, vegetarians actually end up with higher concentrations of AGEs in their plasma. (23) The authors hypothesized that their results were due to the increased fructose intake of vegetarians, although another plausible mechanism appears to be the inhibition of AGE formation by carnosine, an amino acid found in meat. (24)(25) Either way, I wouldn’t be terribly concerned about AGEs in meat, although I still recommend favoring lower-heat cooking methods to avoid HAs and PAHs. Overall, there’s no good evidence that red meat is more inflammatory than other meats, and some evidence indicating that it’s less inflammatory. Just like any other food, it’s certainly possible for people to have individual intolerances to red meat that might induce inflammation, but there’s no reason for most people to restrict red meat on the basis of inflammation. Additionally, AGEs from meat are probably not a concern, and meat eaters might even be better off when it comes to plasma levels of AGEs. 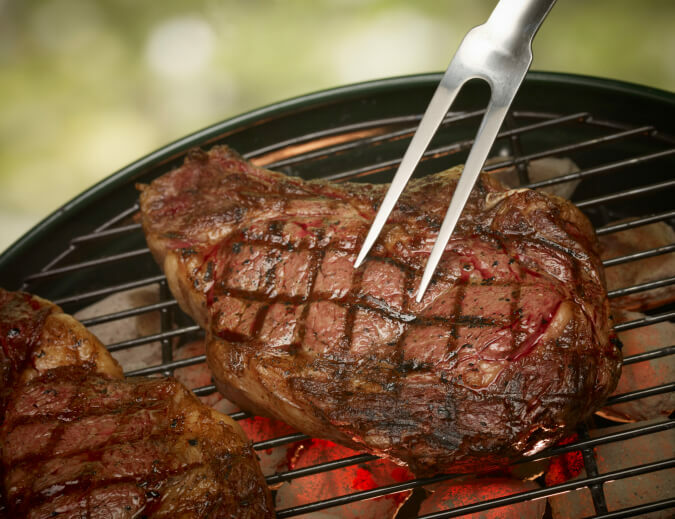 Any concerns about other compounds produced by cooking meat can be minimized simply by favoring wet or low-heat cooking methods, or using a marinade when high-heat methods are desired. I hope I’ve addressed all the remaining health concerns with eating red meat, but I’d like to hear your thoughts in the comments below. Yes, the information provided in the youtube clip Vegout linked to needs to be addressed. Will I get a response? I am getting rid of pills,and insulin in my life at age 68. Single male with two dogs that walks 10 miles a day and change to a plant based diet with fish. No more insulin so far for me. I have diabetes 2 and I want this out of my body. I cannot eat red meat, pork, processed sugar, processed food and absolutely no dairy! Will I ever be able too again? I am doing this and it is so hard. If this works why can I not help others. I am not certified! Really!! Please provide links to the scientific documentation you base your claims on. Also, who is funding the research? Remember when studies suggested sugar was not harmful? I find most of the post humorous. The people claiming red meat causes them pain don’t appear to acknowledge that it could be their body that is the problem and not the red meat. Millions of people eat red meat and it doesn’t cause them any problems. I have a nerve disorder and, yes, if I eat too many foods that caise inflammation I have pain. The problem is me…not the food. Do you want to live forever? I certainly do not. Some foods are better for us than others. I bet some of these people bad mouthing meat are smokers, drinkers and don’t exercise yet all their aches & pains are from the red meat. There is one factor you need to look at for whether we should eat meat. Get up, walk up to a mirror and smile. You will see flat teeth and a couple pointed teeth. We are designed to be omnivores! You disagree, take it up with your maker! I learned this in sociology class when a civilized cutler becomes “over-civilized”. We start to seek out new age diet and lifestyle fads. Veganism is the farce of the past 20 years. What food manipulators like Monsanto does is an entire different discussion. I don’t know exactly what it is about meat, but eating it makes my joints swell. My mother and sisters have very bad arthritis, and their fingers are all twisted up. Mine started to do the same thing. Then I noticed that it only happened after I ate a nice big steak. If I ate beef all week … which we did when we bought whole grassfed beef … I could barely walk. I suspect that neu5gc is the culprit. Fish and chicken and eggs I can eat all day, even the high-purine versions. I’ve mostly dropped beef, pork, and lamb from my diet and my joints thank me. Yes, they have good stuff in them, but actually eggs and shellfish are higher in nutrients than mammal meat is. So sure, they haven’t proved it. So what? It’s easy enough for me to do my own experiment in this case. I can also look at people I know who eat a lot of beef … even grass-fed beef … and see how they age vs. the chicken/egg/fish eaters. So far the beef eaters seem to have far more arthritis. In the Lewis and Clark journals, Lewis noted that the Indians had high rates of “rheumatic problems” … their diet of deer meat and buffalo didn’t save their joints even back then. I also suspect that part of the issue is taurine. Yes, there is taurine in beef, but not nearly as much as there is in raw milk or seafood. The Maasai don’t eat all that much meat, but they do drink a lot of milk which is loaded with taurine. The taurine would protect their blood vessels and heart. Also I think there may be less neu5gc in milk, and more ac. If you look at heart disease and fat, the correlation isn’t very clear. But if you look at heart disease and taurine excretion, there is a very clear correlation. Plus giving more taurine to a person helps heal the heart. The only connection with fat I can find is that taurine is used to make bile, so in a higher-fat diet you use up the taurine to digest the food. That’s not an issue if say, you are an Inuit eating a lot of raw fish. But it’s a huge issue if you are a vegan or eating a typical low-taurine American diet. The amount of taurine in the food you eat largely depends on the cooking method too. Most American food has the taurine cooked out of it. Humans can synthesize it, but the researchers are now thinking we aren’t very good at making it, so the people getting it in their diets are healthier. Heather, I can appreciate your comment. I have been eating paleo for about four years now, and didn’t come across the idea that red meat might be inflammatory until the last six months. Long before that, I noticed a major difference in my RA when I eat beef. One serving is not a huge problem, but if I eat if for more than one meal in a row (which I would typically do, since I try to batch cook every two to three days), my joints will get worse and worse. And the beef I eat is 100% grass fed, raised by someone I went to high school with that I trust implicitly. As always, it depends on the person…but I truly do believe there’s something about red meat that does NOT agree with me. I have to agree also. I have given up red meat (which was 100% grass fed) and pork. I have Lupus, RA & Sjogrens Syndrome…all of which come with severe joint pain send swelling. Since giving those up, I have noticed a remarkable difference in swelling and pain, not to mention, my IBS is more under control! The first study sited seems to be supported by Meat and Livestock Australia Limited. This makes me wonder about the credibility of the study? Red meat is very good for you in moderation (and balanced with vegetables). What do you think our pre-historic ancestors ate? A bunch of chicken? Or let me guess they were completely vegan. Give me a break. And the World Health Organization study on red meat and carcinogens that have recently come out are easily taken out of context by the uninformed and used as fuel by vegans and anti red meat eaters. 2). We treat our meat badly. Not only are the cows, pork and chicken we eat mostly sick, unhealthy animals, but some of the ways we process it that are so integrated into our society are pretty terrible. Quality/whole cuts of meat is a whole other world. 3). A significant portion of the WHO study was based on the compounds that form from cooking red meat over high temperatures and charring it. Try not to do that all the time and you’ll be fine. 4). Bacon is only considered carcinogenic because of the nitrates being cooked at high temperatures which form nitrosamines. Many people are scared of the term “nitrates” but guess what, your body naturally produces nitrates and needs it to survive. The whole “uncured bacon” thing is not going to save you either because most “uncured bacon” is preserved with celery powder, which is fully capable of forming nitrosamines when cooked at high temperature. Don’t burn your bacon people! Cook it in the oven instead of pan fry it if you’re worried. The bottom line is people need to chill the eff out about the red meat thing. It’s very good for you in moderation and balanced with veggies (and I don’t mean a bunch of grains, which should be balanced as well). If you’re one of those people who’s going to be scared into veganism because of the WHO study, not only are your taste buds missing out but your long term health is as well. I doubt Mr. Flynn hunts. Otherwise he would know that hunters are not always successful. I doubt very much that our ancestors ate meat with great frequency or on a regular basis. If he wants a to emulate our ancestors I recommend that he gorge himself on meat 5 or 6 times a year and eat berries and roots the remainder of his days, perhaps fasting (24 hour days, please) 2 or 3 days per week. We hardly ever hunted alone, so did we eat meat most days in pre history? Yes we did by a large margin. Why does everyone promoting no red meat beleave we were mostly vegan or vegatarian. When we lived in area where meat(game) was widely advalible guess what we did. We hunted down and ate it. Now sense science has proven we are super predators(killing the alphas of herds and other animals) there should be little dout we ate meat daily. Alfa are the diggest portion of meat so we hunt and share. Yes hunt by oneself is very in effective, hunting as a group far more effective. We have always hunted in groups its only modern(800 bcu) man that hunts by himself, this is usually some kind of proving themself against nature deal. So ya if you go out and hunt by your lonesome then odds of you bring home super not so good and berries and roots it is. This is not how evolved though. “Meat is bad for you”…er… based on what evidence exactly ? Do you think humans are naturally vegetarians? Can you point to any vegan/vegetarian civilisation at any time in human history? Yeah, it’s funny because he accuses other people of not mentioning the limitations of the studies they cite 😛 Pretty much brings this whole article into question. It is a rather large piece of info to ommit. I am a lchf convert and have had great results from this lifestyle. My friend has RA and is now in a wheelchair. She is convinced that red meat and animal fats make her condition worse. As all I have read suggests that animal protein and fat do not raise inflammation is it different for RA sufferers? I have had RA since I was 16 and YES meat and dairy make it a lot worse and cause inflammation. For me, soda also causes flare ups. The premise of this experiment is flawed. Mice are not carnivorous, they are plant eaters. You may as well feed meat to rabbits. Of course you will get a bad result.. The results of the sited study (although correct) cannot show that the consumption of red meat causes inflammation. QUITE SIMPLY, THE STUDY IS RIGGED. From raw-milk-facts.com: Continual development encroaching on their semi-arid grazing lands, poor supplies of clean water, lack of sanitation, non-existent medical care and high levels of waterborne disease all take their toll. Many of their children die before reaching the age of five. It is not wise to use the Masai as an example of health. Their average lifespan is about 45 years old. why do you think that is? I don’t suppose infant mortality or poor medical science has anything to do with it…? The life expectancy of the Masai is 50 years, so its not just an issue of infant deaths decreasing the average life span figure. They actually do have a high rate of atherosclerosis from the meat they eat, but they also are extremely physically active because of their lifestyles, so that’s another factor. They also eat lots of fresh plant foods and herbs. Even if an American wanted to eat as much meat as they do, they would have to make sure they got as much exercise and they ate as many beneficial plant foods as well. On Wednesday, I showed you how a particular fat — olive oil — can help your arteries. The polyphenols in this amazing fat help your cells that line your arteries stay healthy. These endothelial cells depend on polyphenols for their health. But another study shows that they don’t rely on the fat. As you may know, I’m not a fan of the Atkins diet, which is a high-fat diet. Yes, it will help you lose weight. But it has a hidden dark side. A study on 20 obese volunteers between the ages of 29 and 39 looked at the impact of a low-fat diet and a high-fat diet on endothelial function. The American Heart Association recommends a “low-fat” diet of 30% calories from fat. Atkins recommends a low-carbohydrate diet that has lots more fat. In this study, the researchers randomized the participants to eat either the AHA recommendations or the Atkins diet. They kept total calories the same for the two groups. Both groups lost about the same amount of weight. The researchers then measured their endothelial function by brachial flow mediated dilation, an accepted marker of endothelial function. They found that it was the low-fat group that had significant improvement in their endothelial function. This is a measure of the ability of your arteries to dilate. If the AHA “low fat” diet beats Atkins high-fat diet in terms of endothelial function, think of what a lower-fat diet can do. Pritikin and Ornish have proven it out that a 10% dietary fat intake is optimal. Atkins helps you lose weight. But the hidden cost to you may be much higher than the excess pounds. High fat is not the way to go. The reason olive oil helps your arteries is not the fat content. It’s the polyphenol content. That’s why you shouldn’t eat a lot of any fat. There’s just not enough polyphenols in a high-fat diet to keep your arteries healthy. You’ll find an abundance of polyphenols in plant foods, not most high-fat foods. So stick to a diet high in veggies and fruits. You’ll see the pounds drop off – and your arteries won’t clog from too much fat. Source: “Benefit of low-fat over low-carbohydrate diet on endothelial health in obesity,” Phillips SA, Jurva JW, et al, Hypertension, 2008; 51(2): 376-82. The arteries of people on a low carb diet are dilated at rest, they don’t need to dilate much more to reach the “normal” size of a post occlusion hyperaemia distended artery. Blood flow is better in the low carb group. I was just wondering that kangaroo can not be good for someone who has had a triple bypass…..correct? I understand that its a red meat…related to heart disease? Is that correct? I have a friend whom has heart disease…eats kangaroo almost 3 times a week…not good! there are many difficulties eating red meat in one’s blood type is other than type-O. While A’s tend toward vegetarianism and AB’s are a blend of A’s and B’s, B’s tend to thrive on non-red meats of fowl, kangaroo and fish (dietary strategies promoted by http://www.dadamo.com). Their are still numerous problems associated with this strategy and with paleo too, especially the variations that seasons bring … ie. there is no grass during winter and freezing alters protein structures, etc, etc. Not sure why everyone thinks there is some conspiracy against red meat. Maybe it’s bad for people. Maybe it does cause inflammation. Maybe through breading and mutation it’s no longer healthy. Maybe it wasn’t healthy before. There are so many factors and to keep leaning on such and such tribe was healthy is just desperate. We should be concerned with health and not our personal desire to eat any one thing or other vested interests that distort truth. Why do we always assume there is some explanation when something negative comes out against meat. It’s all very silly. I have eaten meat my whole life and i can say I have never seen it as anti-inflammatory. I was vegan for a few months as an experiment and I certainly had way less inflammation. There is also the issue of endotoxins in meat which also cause systemic inflammation. There are other ways to get omega 3’s from seeds that have none of these negative effects. Seeds have their own problems too of course, but we should be seeking for what works for us and not perpetuating some brainwashed fanboyism. Would have to agree. I would say the meat that our parents and grand-parents ate would have been quite different from the meat of today. Yeah, it must be bad for us because newspapers say it is. Good call!!!! Well I am going to talk from the perspective of somebody who is trying to gain weight due to underweight condition. I was told about this lack of evidence for inflammation from red meat and that it is a good source of calories without eating a high proportion of carbs/sugar. I know bugger all about the technicalities of this. All I do know, is when I started eating a lot of (about 1-1.5lbs) red meat each day, I get terrible shooting pains in my feet and nerve twitches. It triggers severe inflammatory response in me. I am giving it up altogether and eating a much higher carbohydrate diet. I can’t go on with those symptoms. Hi Richard, I can relate to your post. I just posted my comment above in regards to something similar. I’ve had ribeye on June 6, Jul 11, Jul 29 and prime rib on Aug 21. On June 7, Jul 12, Jul 30 and Aug 22, I awoke with severe (debilitating) back pain. Anecdotal? Perhaps – but I think I’ve finally learned that fatty cuts of beef don’t agree with me. Oddly, hamburgers don’t appear to bother my system. As ever, an excellent article and I for one will carry on eating red meat three to four times a week as part of my low carb diet. As someone who is also interested in exercise I’ve recently changed over from an hour of aerobic exercise every other day to a relatively new HIIT programme, and there is one particular aspect of this I would ask you to comment on. My question relates to the mention of a “protein dependent immune system”. Does this literally mean that the immune system is dependent on the intake of protein, and that a lowering of protein intake would equate to a lowering of the body’s immune system, and in general do you agree with my assumption that HIIT seems to be particularly suited to those on a low carb (which in reality means a high protein) diet? Hi there, a friend of mine who has been quite the health buff. He ate great and worked out frequently. He took the HGH and although it helped with muscle mass it messed his insides. He had a heart attack at the age of 37 and it indirectly was caused from the HGH. The HGH enlarged his heart and weakened the arteries surrounding his heart. He now has to be extremely careful..
subject, it might not be a taboo matter but usually folks don’t talk about these subjects. To the next! Best wishes!! I found out about Neu5gc recently and I am concerned, especially since I have an inflammatory skin condition. Would it be better to switch to lean poultry (low omega-6) than continue to eat red meat? See Paul Jaminet’s posts on the matter. I am considering a 30 day elimination of mammal meat and dairy, as I seem to have unexplained systemic inflammation and / or Hashimoto’s. I was diagnosed with M.S. about a year after a freak episode occured with my spine. I’ve had extreme back pain ever since. Although I really enjoy my red meat, I’ve slowly cut back and am at a point where i’ve almost cut it out completely. I’ve noticed a drastic change in my pain level and how much it has reduced. I’m no doctoc, but for me, the red meat had elevated some sort of inflammation because I noticed an increase in pain shortly after. Just read all these posts and thought to share my two-cent experience! Thanks for posting. I have been on LCHF for 1 yr, 8 months. I have corrected blood pressure, insulin resistance, menstrual problems and have lost 76 lbs. However I am now looking at reducing red meat and going to more turkey and fish as inflammation has not improved. Lots of foods cause inflammation including dairy and eggs. We have to continue to experiment and possibly try elimination diet. Thanks for sharing. It’s causation anyway. Their lifestyle is totally different than ours, as well as med care or the lack thereof. They walk everywhere they go for miles. A friend worked with them. Theses studies do not take into account the entire picture. I am still studying about inflammation. Yes one loses weight but eating meat and fat has not reduced inflammation in me. has not reduced inflammation. If the Masai die young it is probably due to other reasons. They live in mud huts and burn dung for fuel also. A dietary compound abundant in red meat and also used as a supplement in energy drinks promotes the hardening of arteries, or atherosclerosis, according to a new study by the Cleveland Clinic. Bacteria in the digestive tract metabolize the compound L-carnitine into trimethylamine-N-oxide (TMAO), a metabolite previously linked to atherosclerosis in humans, researchers with the nonprofit academic medical center reported in the journal Nature Medicine. The study tested the carnitine and TMAO levels of over 2,500 omnivores, vegans and vegetarians. Researchers found that vegans and vegetarians, even after consuming a large amount of carnitine, did not produce significant levels of the microbe product TMAO. But omnivores consuming the same amount of carnitine did. Researchers also tested the cardiac effects of a carnitine-enhanced diet in normal mice compared with mice that had suppressed levels of intestinal microbes and found that TMAO changes cholesterol metabolism at multiple levels. They found that increased carnitine levels in patients predicted increased risks for cardiovascular disease and major cardiac events like heart attack, stroke and death, but only in subjects with concurrently high TMAO levels. Prior research has shown that a diet with frequent red meat consumption is associated with increased cardiovascular disease risk, but that the cholesterol and saturated fat content in red meat does not appear to be enough to explain the increased cardiovascular risks. This discrepancy has been attributed to genetic differences, a high salt diet that is often associated with red meat consumption, and even possibly the cooking process, among other explanations. But Hazen said this new research suggests a new connection between red meat and cardiovascular disease. The U.S. meat industry issued a statement downplaying the connection between hardened arteries and the consumption of red meat. AMI also said the National Institutes of Health fact sheet on L-carnitine shows it is safe and essential. The study is the latest research by Hazen and his colleagues exploring how gut microbes can contribute to atherosclerosis, uncovering new and unexpected pathways involved in heart disease. In a 2011 Nature study, they first discovered that people are not predisposed to cardiovascular disease solely because of their genetic make-up, but also based on how the micro-organisms in their digestive tracts metabolize lecithin, a compound with a structure similar to carnitine. I will respond to it in a blog post at 8am this morning in great depth. And now the media is full of the latest attack on red meat (The New York Times, Carnitine, Heart Disease and Science). So, Chris, can we expect a posting with your thoughts? At 8am this morning (Wednesday). I just read an article on HeartWire: http://www.theheart.org/article/1526279.do suggesting that L-carnitine in red meat may up CVD risk via altered gut flora. It seems like yet another study aimed at vilifying red meat and promoting a “heart healthy” low-fat, low-cholesterol diet for disease prevention. What are your thoughts on this? Sorry that i didn’t see this comment before leaving mine. I was just about to order a betaine/TMG supplement today, as per Chris’ low-B12 advice (taking 4 supplements: methylcobalamin + folate + TMG/betaine + potassium), when I saw this BBC article warning against taking betaine. For my low B12, I don’t know if I should just take the other 3 and skip the betaine? Red meat opponents are at it again confusing symptoms and cause. Sometimes any response lends credibility to non credible argument. In trying to explain these anomalies and the concept of balance to customers regarding essential fatty acids in red meat after years of the anti fat lipid hypothesis (Ancel keys) I often use analogies, comparing the human body to a two stroke engine such as a power saw or leaf blower. Most understand they run on a mixture of gas and oil and need a spark to work. With the gas as Omega 6 and the oil as Omega 3 and the spark as CoQ10 all quickly understand too much gas(omega 6) en-flames, causes engine to race and eventually seize, too much oil(omega 3) and/or lack of spark and it will not run. The weight of evidence in favor of the goodness of red meat as a human fuel, in balance, goes back over a million years in our evolution and far outweighs any indirect correlation to bacteria and a component of it considered in isolation. I will certainly keep eating it daily. With regard to human health, the evidence is irrefutable when considered as a whole, as adduced by Chris and others. Thank you for posting a reply to my question, but I was not speaking of eating red meat — I was speaking solely about taking isolated Betaine/TMG/trimethylglycine as a standalone nutritional supplement, as part of Chris Kresser’s 4-supplement plan for people who have low Vitamin B12 and need to take supplements in order to heal their body’s imbalance. I would really appreciate your thoughts on this- thanks!! I have read the study and my immediate reaction is to reply as did the beef eater old stockmen of my youth when newspapers reported a correlation between red meat and heart attacks sixty years ago. “Better to go with a heart attack and all your marbles than a stroke or other disease.” These people believed in eating beef daily and invariably lived into their 90’s. I have eaten beef daily whenever possible since and had very good blood analysis results a couple of years ago with low triglycerides and normal range cholesterol. This had improved in blood sugars in the normal range from a couple of years before when I was more overweight, (80lb.instead of less than 40lb. but I don’t walk with dogs like they did daily) I still eat 8 to 10 ounces of beef daily but have cut out all chicken, most pork and most breads and potatoes because of my personal research and the evidence relating to Omega 6:3 ratios etc. in grass fat beef. I also feel much and younger and mentally alert. Further, even if there is some connection it is not cause and would refer you to Chris’s last paragraph on Neu5Gc as the same applies. Now in my early 70’s with good health, I will continue eating grass fattened beef daily if I can as it supplies all the nutrients I need and passing suddenly with a heart attack is not the worst way to face the inevitable. Besides I really enjoy eating beef, in all its versatility, especially the healthiest Knuckle/ marrow bone/organ meat soups with carrots and other greens, with several servings weekly. I have no doubt that these contain all healthy essentials as our forbears knew. Sorry I awoke to your comment and did not realise you were asking Chris. But nice to know you understand. And hopefully get to enjoy the best of food. Anecdotal evidence is terrible evidence. This is a science website, people. You would at least think that the comment section were about the facts in the studies or other related studies that could possibly correlate/contradict the findings in this one. Are we so scientifically illiterate that even on a site designed to examine facts we rely on anecdotal evidence from complete strangers? Come on. Thank you very much for these articles re the health giving benefits of consuming red meats, especially grass fattened beef. I have come to believe they are the modern equivalent of seasonally fat wild big game ruminants, consumption of which allowed our brains and IQ to develop and eventually their domestication. This in turn allowed the evolution of settled agriculture and civilization. Unfortunately the symbiotic and synergistic relationship inherent in pastoral, animal husbandry, and sustainable cropping food systems, has been lost in favor of industrial grain farming, leading to all kinds of problems for soil, and air upon which humanity depends. Settled agriculture has led to the rise and fall of previous civilizations through grain growing and its control of the many by so few until the fundamentals become overlooked and forgotten. I was recently reminded of this on being sent some scenes of Roman Wall country in UK where I went to farming school in the 50’s within three miles of one of the Roman fortifications being excavated on the ‘Edge of the Empire’ as it is known locally. These fortifications all had granaries with under floor drying and the populace was required to grow grain and pay tribute for its storage and movement on Roman roads, as I understand my history lessons. Recently I have come to realize that we are in danger of repeating the mistakes that led to the so-called dark ages before our enlightened society. Articles such as yours will hopefully lead to true enlightenment and prevent history repeating. I have been collating much the same evidence you cite in your articles and they are very valuable for anyone interested in searching for the whole truth. We have had scientific proof from fatty acid analysis since the mid 90’s that our grass fattened beef is indeed the very best functional food covering all known requirements for health of humans, plus its pastoral production is healthy for environment and integrated with vegetables, gives the healthiest of produce. Romans in the first century knew that 2.8 tonnes of farm yard manure are needed to replace the fertility removed from the soil by any annual crop and nothing has really changed. Looking realistically at the evidence you really said it all with the following extract. Due to brain washing of the last few decades it is very difficult for many who have become disconnected from nature to accept the obvious truth. You need to keep up your good work in debunking the anti-red meat crowd. I saw this article too and was wondering if Chris had any additional insights? I’ll be writing a response shortly. I was just about to order a betaine/TMG supplement today, as per your low-B12 advice (taking 4 supplements: methylcobalamin + folate + TMG/betaine + potassium), when I saw this BBC article warning against taking betaine. For my low B12, should I just take the other 3 and skip the betaine? Thank you. Yes, would really love to hear your take on that Chris! Chris, can you PLEASE comment on the article that Lily brought up in the post below – regarding a potential risk from taking L-carnitine, lecithin, choline or betaine supplements? I take all of these, and so do many of my clients…help! Lily, I surely HOPE that this will not be confirmed, as these supplements are very effective for a variety of conditions, but who knows? I also asked Chris to pls post a comment. Just read this interesting article. What do you make of it? I have been concerned about this, and my attempts to learn more were frustrating.. Thank you for this, Chris. Have you come across any evidence that red meat raises cortisol levels? I went to a continuing education seminar that seemed pretty spot-on about nutrition except the speaker kept saying it was best to minimize red meat consumption because of its ability to spike cortisol. Great to know Michele, if true. Rather than avoid cortisol-spiking, it may be best to eat red meat for breakfast and a supper of veggies should help relax you. May I have the link to the 2nd reference you gave (regarding women and anemia)? I’m working with a teen gal who has iron-deficient anemia and her nurse mother is still with-holding red meat from her diet. I’d love some assistance with research to support the red meat and anemia link. Chris, I think the link for the second reference contains a unique ID that is giving people problems. What about pressure cooking? Does that fall into the high heat category? Thank you – highly informative! You have just skimmed-the-surface on AA, however. It is PgE2 a derivative of AA that is inflammatory. This is more than compensated for because the pancreatic ligand PgE2 sequestors dietary zinc to form the main ‘pool’ of zinc for cells ie.M-Zn-taurine (where M is ‘membrane’. Think of some “hair” … here M would be skin; connected at 90 would be a follicle(zinc) and to the follicle, a shaft(taurine) is connected.. Thank you, Chris, for a balanced and thought-provoking article. Due to personal issues around methods of slaughter and potential unlabelled religious meat in my meat sources, I have all but given up meat. I do eat a lot of fish. I wonder whether you subscribe to the notion of “total anti/inflammation”; that we can balance up, if you like, inflammatory foods with anti-inflammatory foods, like many fish. If so, I wonder what the pattern might me. Just a warning for those who have pet birds – overheated Teflon is very dangerous, don’t use it. The fumes will kill birds. Great article Chris! Grass-fed red meat still can use a strong defender. So many years it’s been bashed! Thanks also for the defense of arachidonic acid, which, of course comes from many other sources than just red meat, but has also been bashed by those who know too little about human physiology. I would add that, not only is it invaluable functioning as AA, but from it our bodies derive so many other valuable substances, like: 1. prostacyclin, the most potent anti-aggretory agent and inhibitor of platelet adhesion; 2. prostaglandin1 (PGE1), the body’s most powerful natural anti-inflammatory agent (stronger than PGE3 that derives from alpha-linolenic acid); 3. eicosanoids; 4. other enzymes that are critical to health! Chris, WHat about acidity. I thought I learned in my nutrition program that it is commonly thought that meat is acidic, due to it’s ash acidity, but that it it in reality, does not create an acidifying effect on the body. I assume it is true that acidity of the body creates inflammation. Does meat acidifying the body and thus cause inflammation? My thought is that if yes, perhaps the answer in no for grass fed beef with more omega 3 makeup. Wonderful, more reasons why I eat red meat almost daily 🙂 I knew there were reasons why my body wants it so bad. Now I just have to remember all of what you just told me so I can regurgitate it to the doubters out there when I get told I am killing myself with red meat. can you recommend some wet and lo heat methods for cooking meat? I use a flavorware on my counter usually cooking the meat at about 350 degrees. It’s great for steaks and hamburgers. I am a stickler for preventing rancidity or otherwise (from heat, light, or prolonged air exposure) ruining the unsaturated fats in foods. Therefore I do things that probably are thought unsavory by typical cooks. But still, I suggest using only roasting (where the oven temp can be controlled and kept between 200 and 300 degrees), boiling, and steaming if you want to get the best value from the meat and minimize the toxins (including the fats you can turn to toxins by overheating). Other tricks are to cook in a way that, though the outside is well done, you have a lot of rare meat left in the cut. I always like to remember that the main purpose, physiologically, for heating meat is to kill excessive surface germs. While some vegetables gain in food value in some ways (release of minerals) by being cooked, I don’t think there is any similar value gain when heating animal products. It’s all just esthetics. And esthetics is culture. And culture’s values must always be tested if you are interested in health. Thanks, Chris. What about the effects of hormones and antibiotics in red meat? Should they be a concern? Do the benefits outweigh the concern? Should we perhaps eat less of this type commercial beef than grass-fed beef, for example? It’s easy enough these days, in most places, to avoid hormones, antibiotics, etc., in chicken, since healthier alternatives are readily available. Not so with beef. Avoiding commercial beef is still very difficult. And what are the effects of cooking, on these contaminants? What’s crazy is that many times research is done…it is done on an isolate. This drives me crazy. Yes, the isolate itself may be toxic or problem causing, but when it’s in whole synergistic form, the way nature intended it to be, with whatever supporting nutrients it is combined with, it can become beneficial. Science can be very misled in this respect. Yes, we may understand the behavior of each component/chemical/gene, but that doesn’t always give the whole picture. your comment made me so happy. What you say is SO important and needs to be kept in mind ALL the time. Unfortunately science works in a way to look at isolates for real evidence, but what kind of evidence do we got from it in the end??? can you comment on preparation of ground meat? I purchase meat in bulk from a local organic farm, and with the side of beef I get a lot of ground meat. other than frying, Im not sure how to prepare in the most healthful way. I love to make chili with lots of sauted chopped veggies, such as onions, peppers, garlic, celery, mushrooms, etc. Brown the meat slowly, drain off the juices, add the sauted veggies, some organic diced tomatoes and tomato sauce, chili powder, cumin, oregano, basil, sage, etc. Simmer for a while. You can put it in containers in your freezer for easy paleo meals. This is good with ground turkey also. I like to microwave my ground meats in a bowl with a cover. Very steamy, wet process, cooks evenly throughout, and stews the meat in its own juices. If it’s not ground, we like to use our crock pot. I use ground beef in chili (try subbing chopped veggies for the beans) and often in stews instead of stew meat. I’d like to know a good way to slow cook it also. Great article Chris, especially for avid grillers and smokers like myself. @Julie Rider – Any marinade with lime or lemon juice, or any type of vinegar will be acidic enough. I have been buying Braunshweiger (smoked liver sausage) from a local farmer. Do you feel that consumption should be limted? Can you recommend a good Acidic marinade? Some of my favorites off the top of my head would be: balsamic vinegar/garlic/onion, lime/jalapeno/onion, or even a marinade with a red/white wine. It’s a great way to infuse flavors into meat, tenderize less “prime” cuts of meat, and reduce AGEs. Nice tenderizing action on beef, too. At the moment I am struggling with a gallbladder inflammation. Even when I eat lean red meat, there is some pain coming up, while at the same time I become very tired. No problems however with all fish even not with fat parts of salmon and lean chicken also gives no problems. I prepare my meat on low heat. Does that happen with grass fed beef as well? And have you ever tried Himalayan salt (particularly the sole solution) and/or raw beets and other great gallbladder supporting foods? Red meat can still be hard to digest if the digestive system is out of whack. Do you experience digestive distress along with pain and tiredness? Try slow cooking some stews! People love slow cookers, but I do mine in the oven to better control temp. Long and slow cooking (say, 6 hrs at 250 for chuck roast) makes beef *way* more digestible for me when I need it to be. Thanks for your remarks. In my case, I don’t think the red meat is the course of the inflammation, probably saturated fat is, but red meat makes it worse. No, I cannot find grass fed meat here, I don’t eat meat except some fish at the moment and yes I use supporting foods, juices and supplements. I am on my way to a flush but my doctor still wants me to wait. I will use your advice for the stew later. Do you know of a good way to slow cook ground beef? I had gallbladder pain a several years ago and did a four day gallbladder cleanse. The fifth day I passed several stones and the pain completely went away. My doctor looked at my gallbladder with his ultrasound a few years later and confirmed that my gallbladder was clear. If this is the kind of flush you are talking about I would say for me it was totally worth it! Great article, Chris! I’m now going to look into some wet and low heat cooking methods.